Jeez, this should have been posted in July! Lucky for current-me, cause I’m swamped with projects for clients that aren’t bloggy. I have a few big projects coming to completion soon, so you’ll see how busy I’ve been! A few weeks ago I went shopping in the fabric district with some friends, and naturally we ended up at Michael Levine Loft. 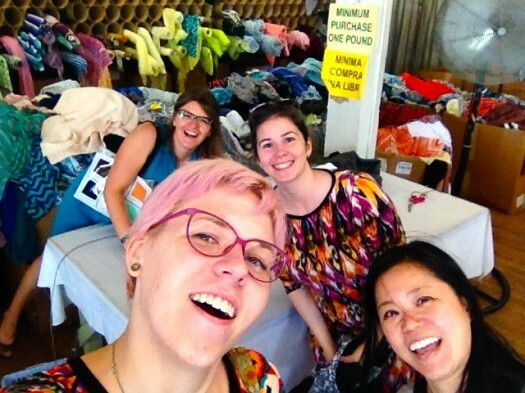 Fabric was $2.50/lb, and I walked away with 11.85 lb (Sandra had a little more). Among my haul was a swishy rayon with black and green chevrons. 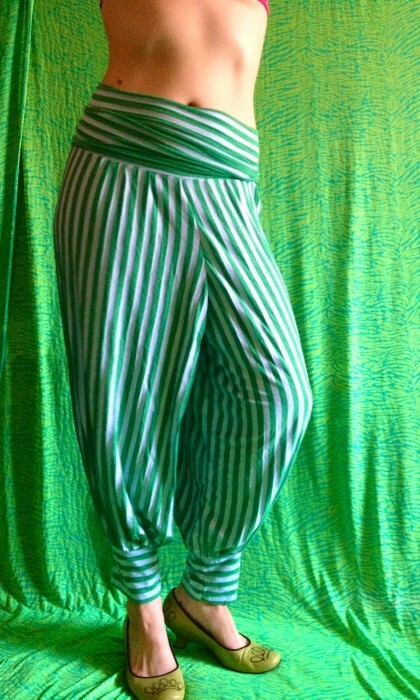 I wasn’t sure about the colors, because it’s dark and I rarely wear green, but the fabric was perfect for some new genie pants. 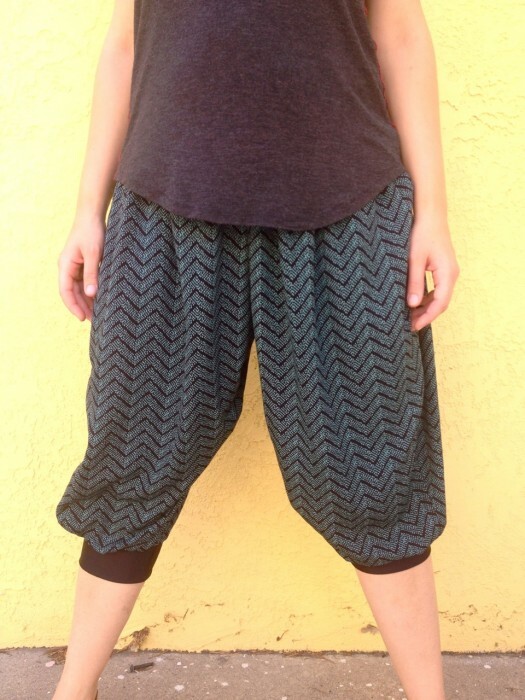 I followed my own DIY genie pants tutorial, with a couple modifications. 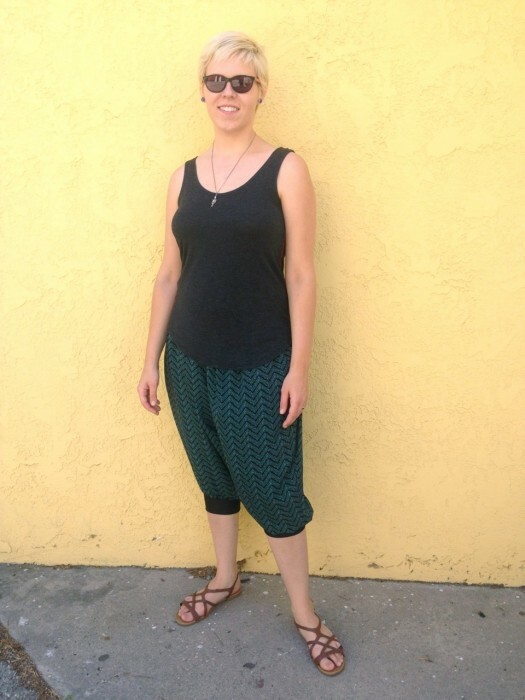 I made these pants with pockets and side seams, and there will be a follow-up tutorial for that. 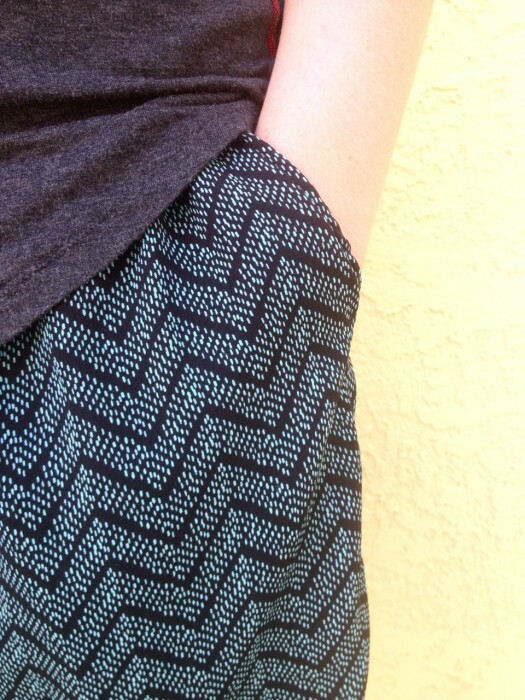 The other departure is that I tapered the legs about 4″ from the inseam and side seams on both front and back. 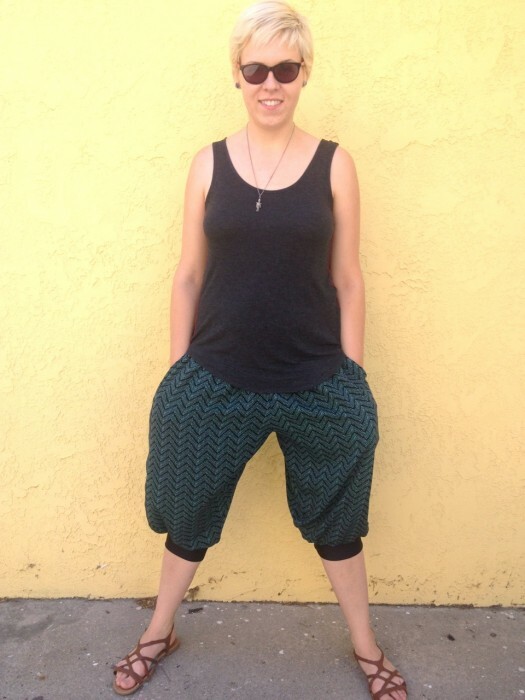 I wanted these pants to be casual lounge wear, and the super puffy legs felt so conspicuous. I also made the tank top. It was a $1 remnant, and super smooth charcoal gray jersey (with rayon?). The seams were serged with red thread on the right side of the shirt, and then I topstitched them to lay flat. It’s strange to see myself wearing all dark colors! They’re comfortable and casual and I love them! Another word from current-me: after a lot of wear, this rayon fabric is starting to pill. Also the elastic waistband is wearing out a bit; I’ll replace this with a higher-quality spadex. I still have a bunch of this fabric, but now I’m reluctant to make anything that requires a lot of effort. First off, my husband would like me to point out that he asked me to make all of this for him. These pants are the harem version of his Disco Mechanic coveralls… Robo Genie? 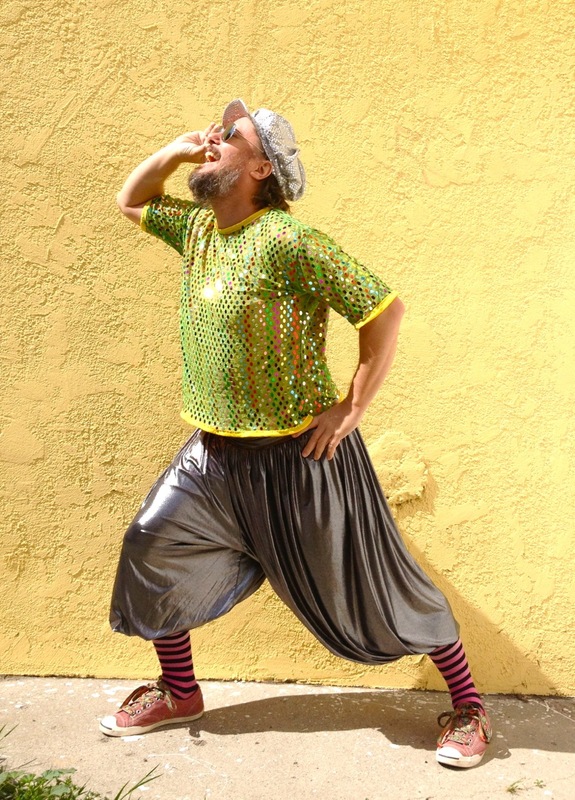 These genie pants are perfect for Burning Man. You can layer warmer leggings underneath, and still be fabulous and comfortable. 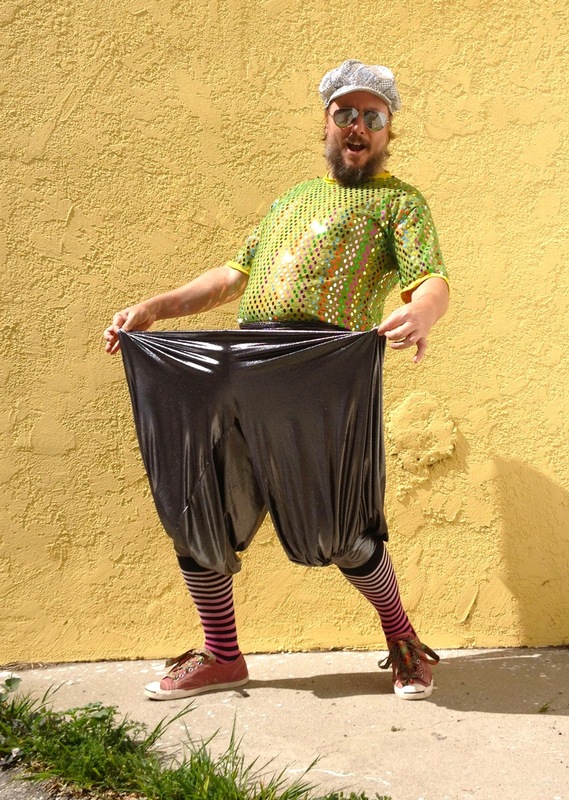 By the way, I have a matching pair of pants myself. 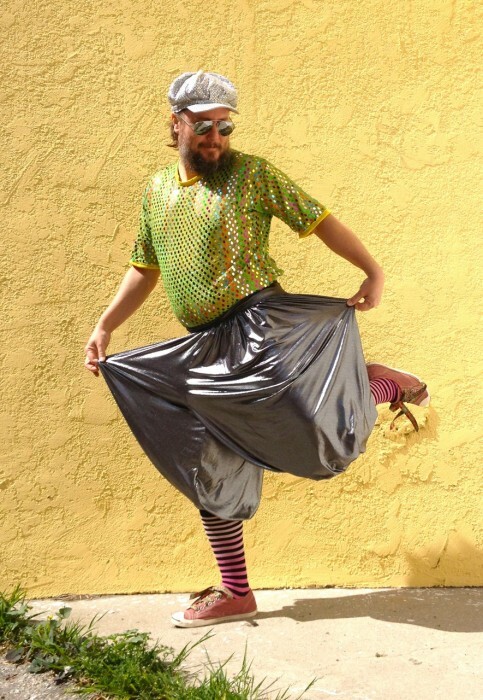 He’s so fabulous and funny! I love that he is so comfortable with himself that he wears these clothes, and that I can make them for him. It’s not like he’s wearing this outfit to the grocery store, but he probably would if I asked him too. I also made his shirt and hat. 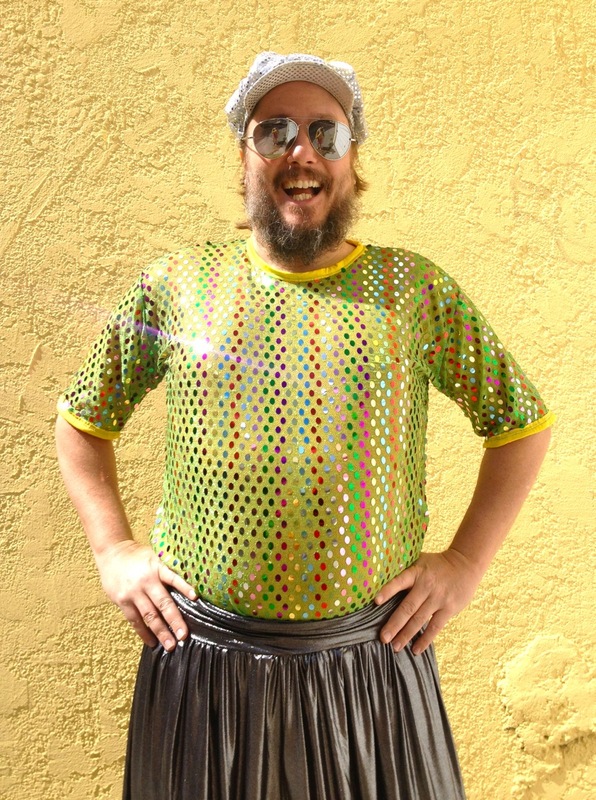 The rainbow sequin tee is lined with neon orange jersey, because it was too itchy! The hems are bound in a lycra tape. The shirt’s a little short, so maybe I will add a band of another fabric. 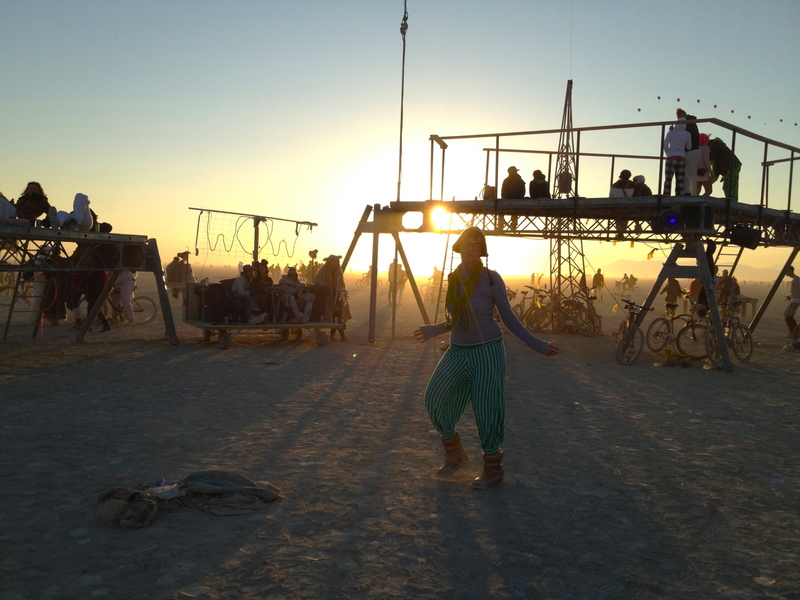 I hand-stitched the hat back in 2009, after Jason lost a similar hat when we met at Burning Man. I used compressed cardboard for the brim, and gave it to him the first time I came out to California to visit. 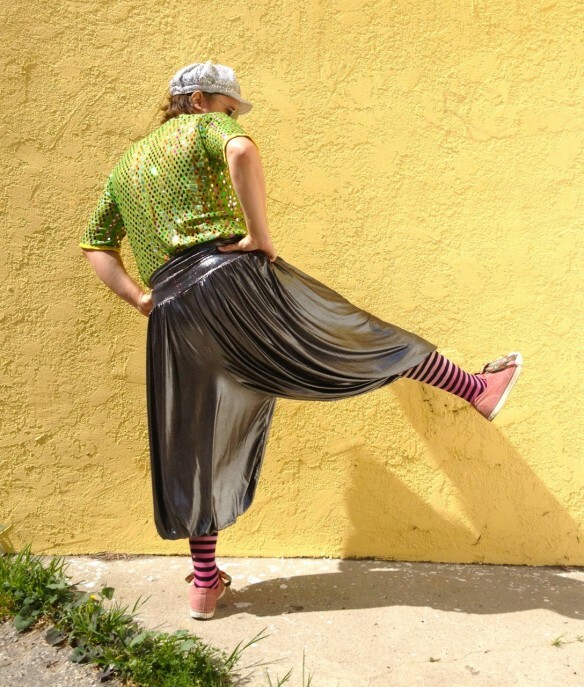 I just made a tutorial for these pants, so check it out if you’d like to make your own. 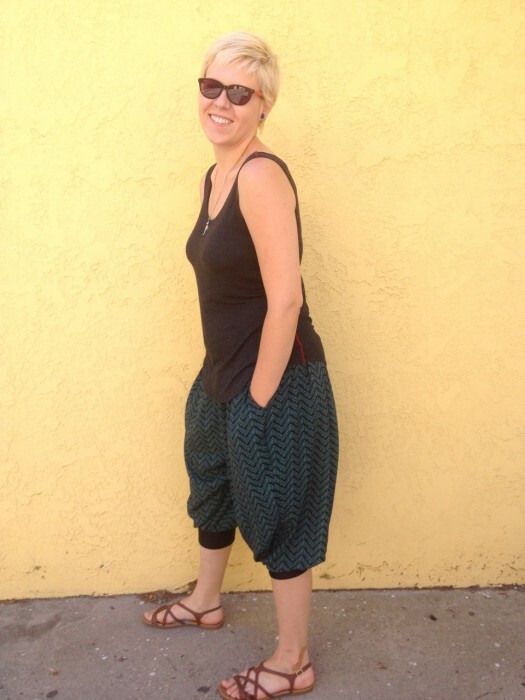 I didn’t give a damn when these were trendy, but I really like genie pants for Burning Man. They’re comfortable for lounging and look great while dancing. I can also layer leggings underneath for chilly nights, and you can’t beat that! I made the pattern myself. Each leg is a single piece, and the un-gathered waist is about 8 feet wide. 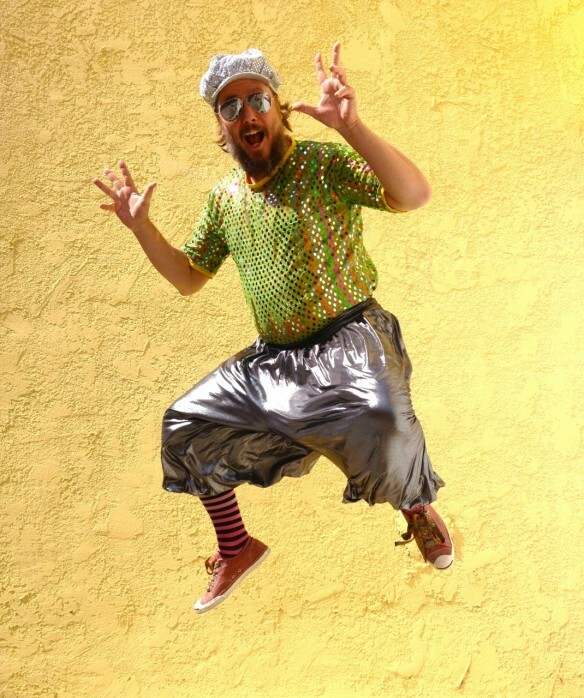 I prefer the more gathered look of the silver pants, which were my second pair. It’s a very easy design to make! 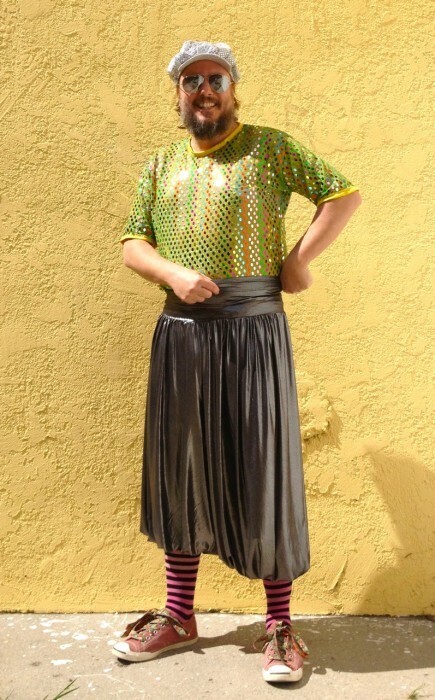 The silver is a very slinky lycra that I’ve used for lots of projects and costumes this summer. The aqua and green stripe is a cottom jersey. Both fabrics were picked up months ago at Fabric Planet. 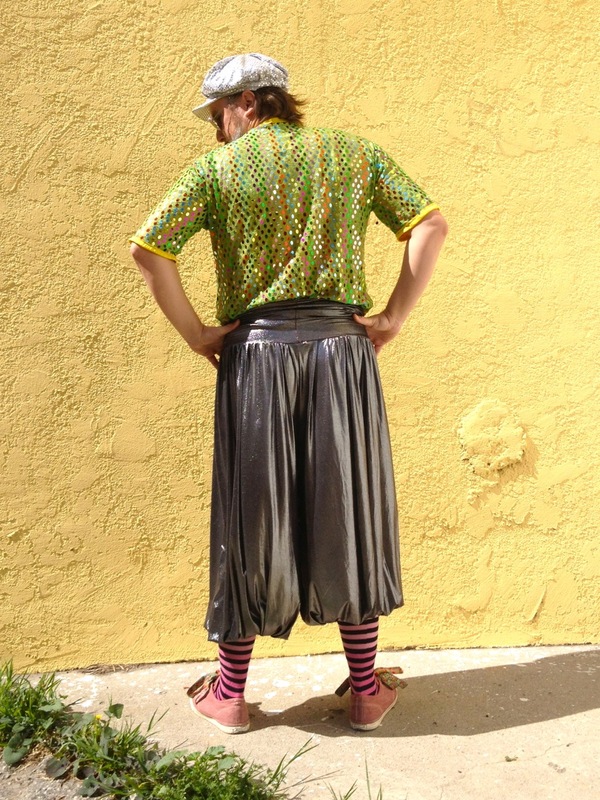 The waistband can be pulled up high, or slouched down around the hips. The leg bands can also be pulled up to my calves, making the leg pouf out more. Pouffy legs! 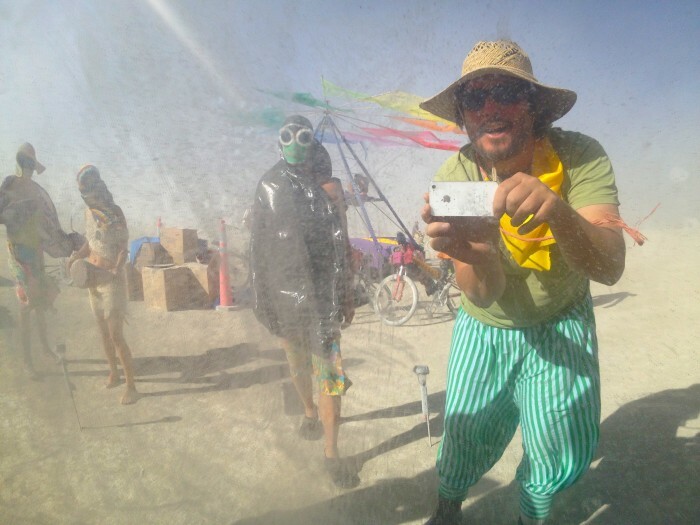 Jason also has a pair of the striped pants, as seen on the playa (with the Sensatron in the background!). He took this picture in a curved mirror. 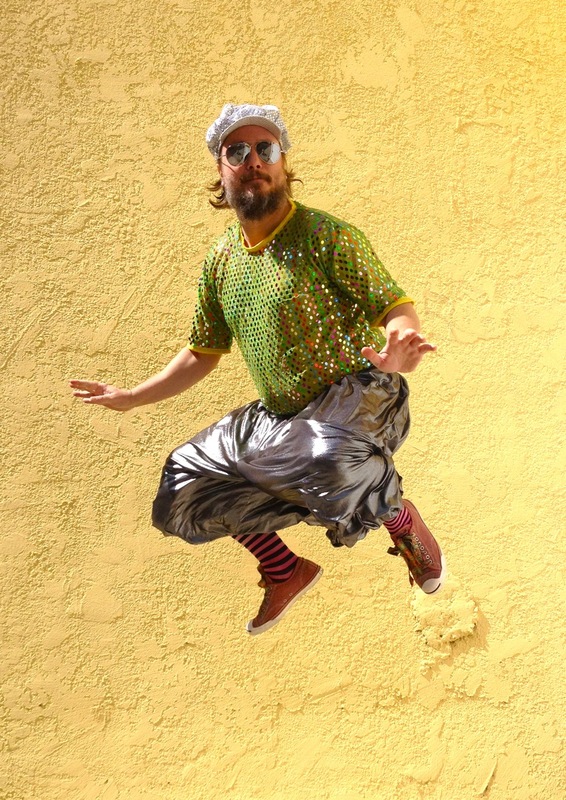 It was a great outfit for dancing at sunrise. Now to make that gray sweatshirt more fabulous! 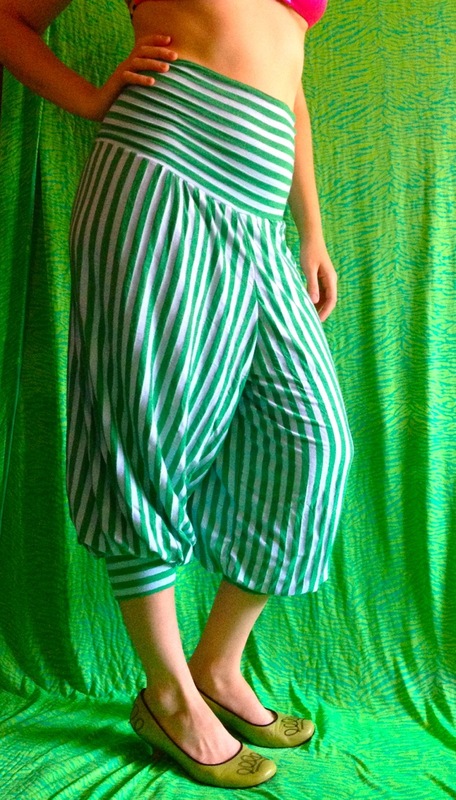 I will definitely be making more of these for next year on the playa–this might replace leggings as my wardrobe staple for Burning Man. 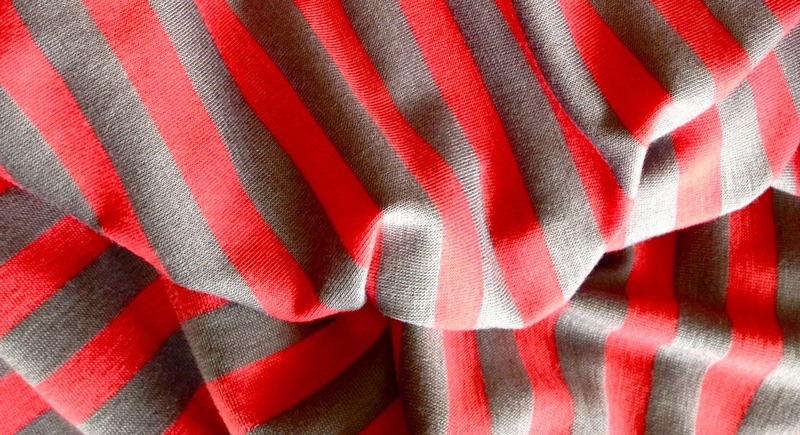 In fact, I’ve already picked up some pink and gray striped jersey for the next pair. I’ve created a tutorial if you’d like to make your own.